As a kid, I was singly responsible for launching a metric ton of steel ball bearings around our yard to dispatch junk birds, rodents, and cans throughout my childhood. For me that was time well spent with one of the wrist rocket slingshots from Daisy or Crossman. I am still into slingshots and still am dispatching junk birds, critters, and cans with slingshots, however I wanted something a bit more upscale and high class than what the kid down the street is using to knock out street lights… I wanted billet. After a bit of searching, I believe I found the Ultimate Slingshot for the slingshot lover. The Montie Gear Y-Shot is a high tech billet slingshot which will deliver a 3/8" bearing at speeds of up to 150 feet per second with impressive accuracy. 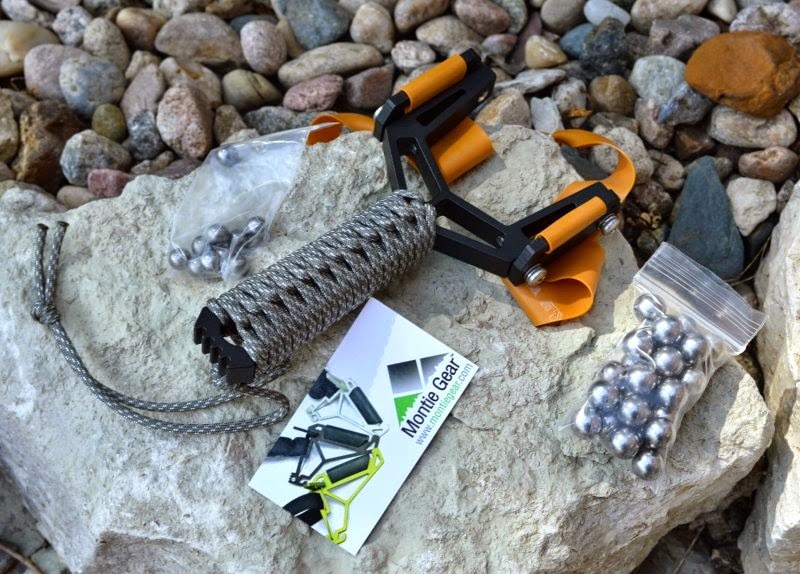 The fit and finish of the Montie Gear Y-Shot is exceptional as it should be for a $130 slingshot. The ½ thick aluminum billet 6061 frame is precision cut with water jet. The skeletonized frame is extremely rigid and provides a simple chassis to attach a variety of bands to. A multitude of power bands can be mounted to the chassis from flat to round bands. All that is needed to make the swap is to just loosen the band braces with screwdriver slip on the new bands and re-tighten. 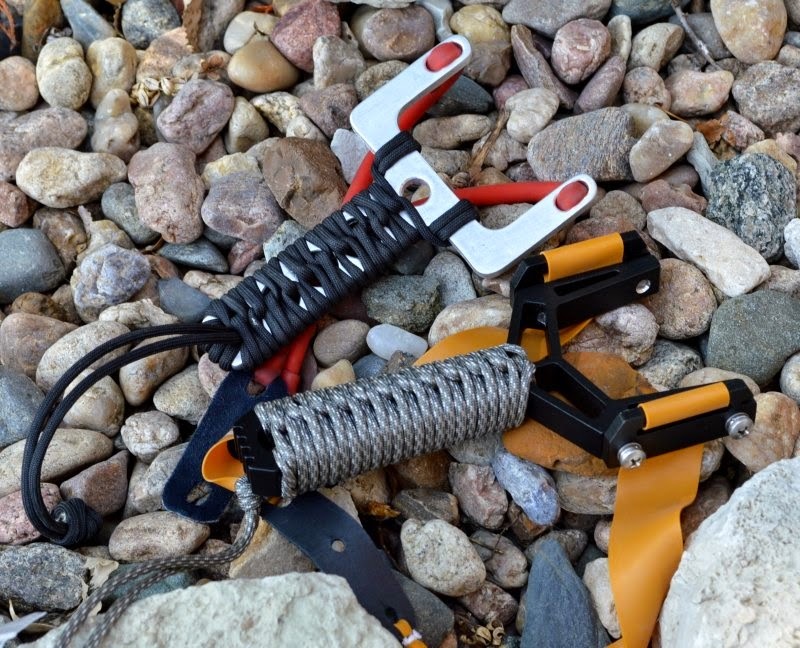 If you want more power, Montie Gear even offers high power double bands which deliver 35lb pull weight and triple bands which deliver over 45lb pull weight if you are strong enough. The beauty of the band mounting design is that even if you were in a pinch to use surgical tubing or inner tubes for power bands the Y-Shot is build to handle the stress. The heli-coil inserts are used to strengthen the threads for the side plate stainless steel screws, allowing for easy band replacement throughout the life of the slingshot, without worry of stripping the threads. Montie Gear offers the Y-Shot in either clear anodized or in a variety of powder coat finishes including hot pink if you want. 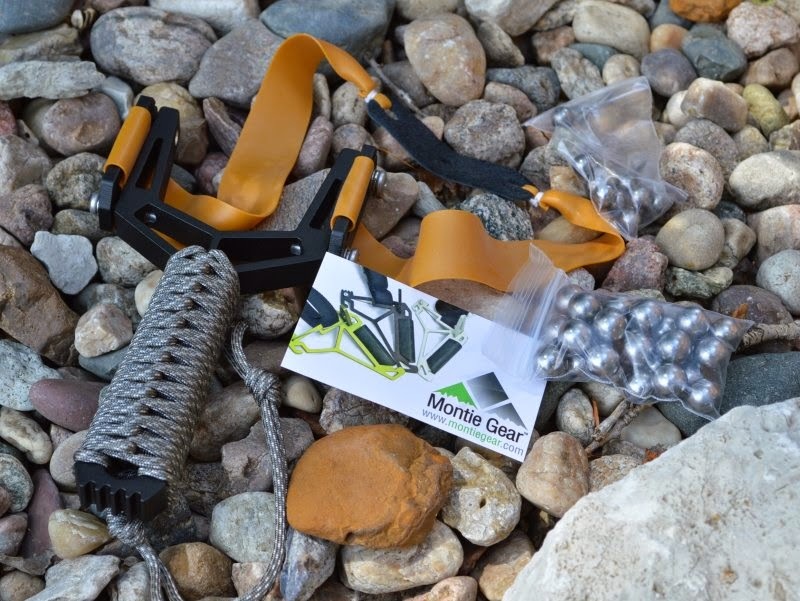 Montie has delivered a true survivalist slingshot with a 550 paracord handle in a number of color options. 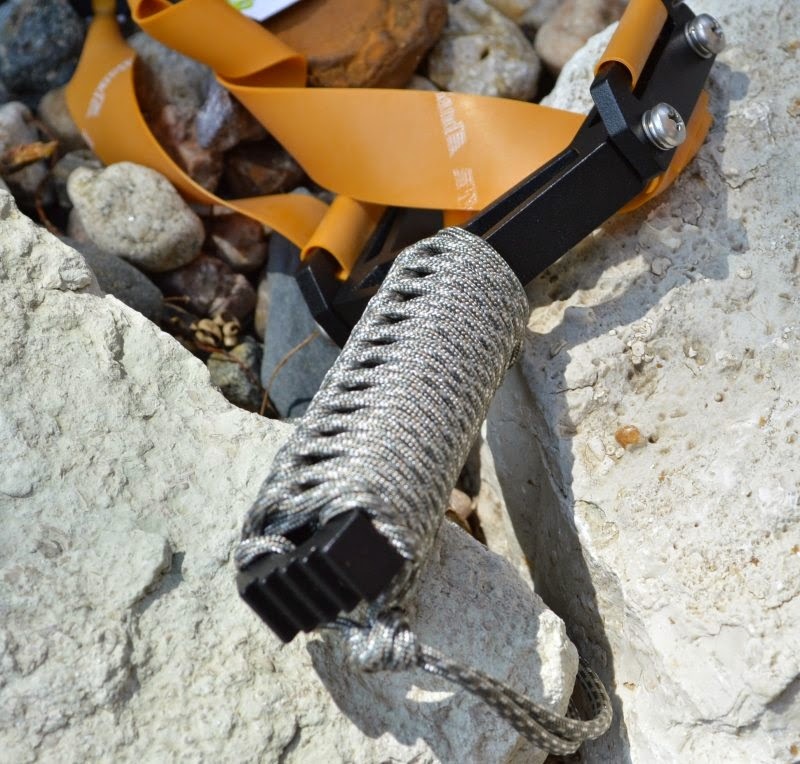 The paracord handle wraps approximately 10 feet of mil-spec paracord around the handle in the event you need a little of the handiest cord on earth. 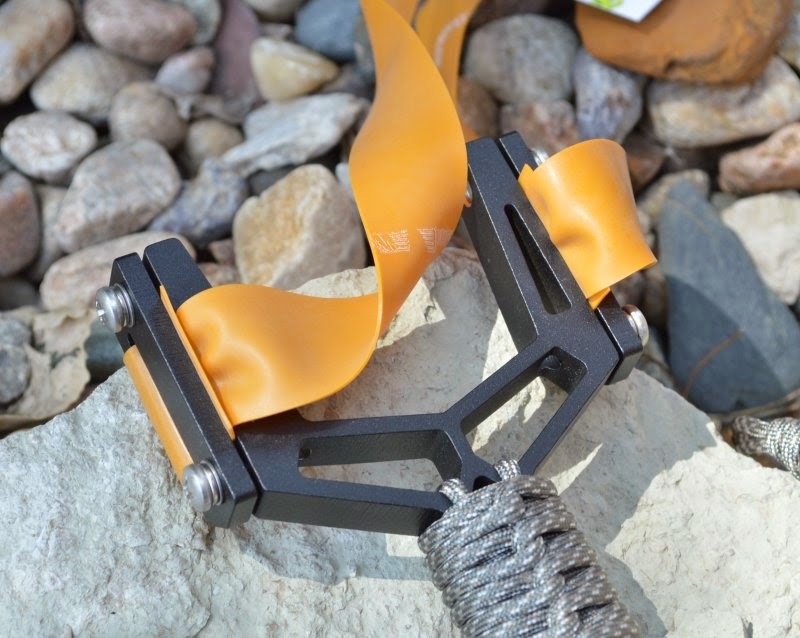 You may think that this is interesting, neat, and cool that someone would offer a high end slignshot, however what is more interesting is the science behind the design and the effort put into the Monties Gear Slingshot. 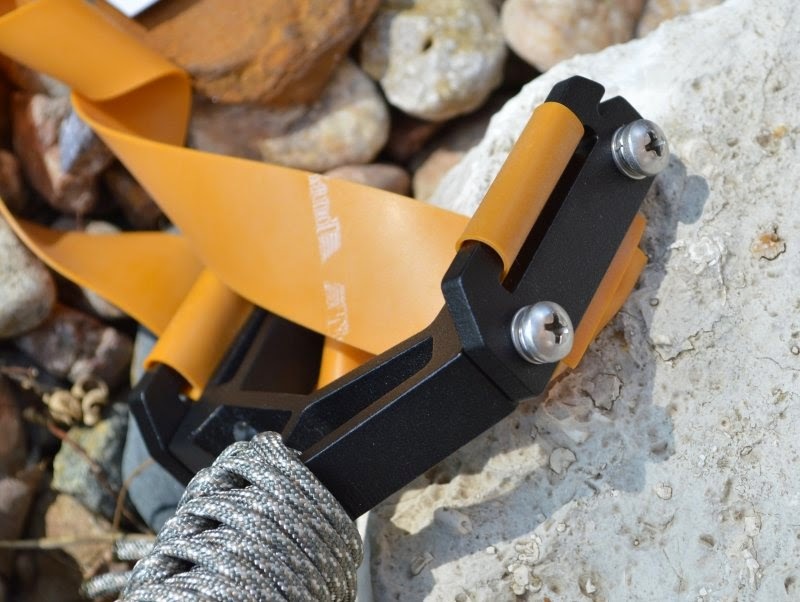 Many of the mass produced slingshot lines would have you believe that tapered tubing delivers more power, however all the serious slingshot shooters use flat tapered bands made from TheraBand Gold / Max elastic material with leather ammo sling/pouches. In this case, the Y-Shot delivers very high energy without the need for an arm brace. That brings up the next point on Monties Gear Y-Shot. They have a ton of accessories. It delivers the most expansive capabilities of any slingshot on the market. They offer everything from wrist braces to red dot mounts, pouches, ammo, power bands, and even arrow rests and take down slingshot arrows. The Y-Shot is not a slingshot, but a slingshot system and the AR15 equivalent in the slingshot world. Just like any slingshot, hitting your target and readjusting your point of aim takes a little getting used to, however once I was dialed in I was very impressed with the accuracy. The more noticeable accuracy improvements of the Y-Shot design is the rigidity and lack of flex and the flat power bands. If you use quality precision round steel shot, hitting a can over 20-yards away is not a hard task at all with some practice. As a general rule with slingshots, the heavier the projectile the more power you will deliver. I know a lot of shooters who swap ammo depending on what distance and game they shot, however I tend to just go for standard ⅜” steel ball bearings or .38 cast lead balls. They hit hard and deliver a smooth predictable arch over longer distances. I have taken up to raccoon sized pests with .38 cast lead balls, however ½” steel and lead ball ammo works extremely well also. If your kid wants a slingshot to use and abuse, this $120 slingshot would not be my first choice, however for the more experienced slingshot shooter this is the ultimate slingshot on the market. The price is up there, however when you start looking at the various higher end slingshots, most will push the $50 range and still not offer the rigidity of this design. There are some misconceptions out there around slingshots. You don’t need an arm brace to deliver high levels of energy on target, flat power bands deliver more consistent power from shot to shot and over time and longer time durability, and larger heavier ammo usually delivers more power onto the target. I love this simple and light design and I am not unfamiliar with the design. A few years ago I made the DIY billet version from billet ¼” thick 7075 aluminum pictured next to the Monties Gear. My homemade slingshot has been well used and proved itself a very worthy little shooter with both flat and tube type power bands. The Monties Gear design is even better, lighter, more precise, and with a higher grade finish than what I was able to achieve in my workshop. This is the ultimate slingshot and I cannot wait to try out whether a red dot sight could improve accuracy - the idea sounds gadgety, however it could be an awesome idea.